Dining options in the areas of Orlando surrounding Disney World and other theme parks tend to be limited and mostly average quality. National restaurant chains have descended upon this overdeveloped swampland and, unlike vacationing tourists, appear to have no intention of ever leaving. Stretches of International Drive can look like the Las Vegas strip, but instead of MGM Grand, Bellagio, and The Venetian, the low skyline is illuminated by backlit signs for Burger King, Denny's and Olive Garden. As a Chicago-born deep dish pizza fan, I was surprised to learn that Pizzeria Uno, established in the Windy City in 1943, had opened several locations in Orlando. It quickly became my goal to stop in and get a taste of back home during my latest Disney vacation. Cozily nestled between a TGI Fridays, Taco Bell and McDonald's, Uno would appear to be the obvious dining choice for any person not wanting their trip to the Magic Kingdom interrupted by a week-long bout with gastric bacterial infections and frequent rides on Toilet Mountain. The exterior of the building didn't offer much to distinguish it from any other run-of-the-mill franchise such as Applebee's, and the interior was an odd mix between Chicago nostalgia and Disney playroom. Pictures of cartoon characters and a large lizard statue furnished the entryway's walls, and black & white posters of the Chicago skyline could be found elsewhere throughout the restaurant. Our waiter, whose name escapes me because he's a waiter I'll probably never encounter again, was upbeat, friendly, and very knowledgeable in regards to our menu choices. It'd been nearly two decades since I'd been to Pizzeria Uno and their menu had certainly been watered down for the general public, including ribs, burgers, and your usual Chili's-esque fare. I obviously went with the classic cheese & tomato deep dish. For a beverage, I decided to try the Uno Amber Ale, which the menu claimed was specially brewed just for the Uno restaurants and unavailable elsewhere. The waiter took our orders and then uttered the scariest sentence I've ever heard in a Chicago-style pizza joint: “That ought to be out in about 20 minutes”. My Uno Amber Ale was brought to the table. Imagine a really, really good beer. This wasn't it. It was more like a glass of heavily carbonated, rusty water poured from the sink faucet of an outhouse in New Delhi. 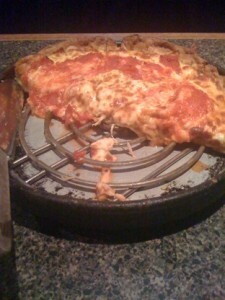 Soon after, my deep dish cheese & tomato pizza came to the table, piping hot and still in its baking pan. Pre-cut into six slices, I couldn't wait to dig in. I took the first slice and noticed something peculiar – a metal coil had been placed at the bottom of the pan under the pizza. I wondered what purpose it served, and it quickly became clear – this coil cut the depth of the pizza and ultimately shortened its cooking time. You certainly don't see this coil in the pizza picture on the menu. I'm all for getting my pizza to me as quickly as possible, but never, ever mess with the depth of a Chicago-style pizza. Another peculiarity I noticed was the cheese. You shouldn't immediately notice the cheese on top, because there should be no cheese on top. 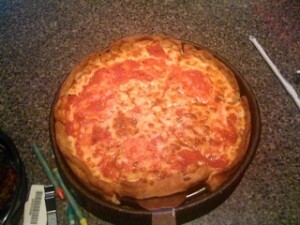 It goes crust, cheese/toppings, and then sauce. Cheese on top of a Chicago deep dish pizza makes it nothing more than a thick-crust pizza found anywhere else in the world. Between the Yankees booth, the metal coil and the top layer of cheese, this experience was seeming to have the authenticity and accuracy of Sean Connery's Irish accent in The Untouchables. The crust was evenly-baked, crisp on the bottom and outright bone-dry around the rim. Eating the outer crust was like snacking on a cracker without the salt flavor. The tomato sauce was offensively bland, lacking herbs, salt, garlic, or anything else that could enhance its flavor. In fact, the only thing enjoyable about the pizza was the cheese; gooey, mildly salty with just the right soft texture that lets it separate during bites and not dragging the rest of it off the crust like so many other pizzas. Ultimately, I was completely underwhelmed. Good cheese is but one part of a pizza and cannot compensate for lackluster dough and sauce. Also, the thickness, or lack thereof, killed any chance at Chicago authenticity. The metal coil in the pan is considered by me to be nothing less than the Antichrist of deep dish pizza. In fact, I'll go out on a limb and say that this pizza was slightly thicker than your average Tombstone, and sadly shared similar flavors. Could Pizzeria Uno be serving frozen pizza? I'm honestly considering its possibility. In my opinion, Pizzeria Uno needs to remember the “Pizzeria” part of its name and get back to basics. Throw out the burgers, seafood, and other entrees and concentrate on the pizza. I was warned several times to opt for Giordano's in Orlando, another Chicago franchise, instead of Uno, and now I know why. 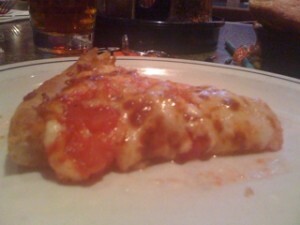 Pizzeria Uno Orlando Florida Deep Dish Pizza – 4/8 slices.